Francis Schaefer, the great Christian apologist and evangelist, argued throughout his ministry that there could be no tree evangelism or renewal of faith without first examining all the secular presuppositions underlying our contemporary culture. As David Virtue pointed out in Touchstone, Schaefer contended that the floodwaters of secular thought overwhelmed the church because Christian leaders did not understand the importance of combating these presuppositions. If Schaefer is right, then traditionalist Christians need to understand that their primary task is cultural before it is ecclesiastical, and that the primary weakness of our leaders is not so much their heresies as their naiveté about the world in which we are trying to live out our faith. We need to engage ourselves in that battle against false secular presuppositions which Schaefer believed was so vitally important for the renewal of the church and the evangelization of our society. We must stand on the conviction that if the modem world is right then the church must be wrong, but if the church is right then the world must be wrong, not for a lack of sanctity, there is quite a bit of that around, but for a lack of sanity. We live in a schizophrenic society which, having divorced itself from its Christian roots, is like a woman divorced from her husband, now vainly trying to regain its pagan virginity. Secularism is itself an inarticulate religion diametrically opposed to a scriptural and traditional Christianity, a religion only now seeking expression in various forms of pagan spirituality and morality. What we call "post-modernism" is an attempt to spiritualize an anti-Christian secularism injected into Western society by the rationalism of the enlightenment. But because it is a "spiritual" development of religious intensity, with a whole panoply of religious myths and cultic practices, it has appealed to those who through most of their lives thought that materialism rather than secularism was poisoning our society, and that any form of spirituality was a possible antidote. In its pseudo-Christian guise, this new semi-articulate paganism can easily fool the very elect - especially those elected to be bishops. Having devoted much of their lives to translating the Bible and the Creeds into the presuppositions of secularism, they are now encouraging their followers to use Christian prayer and sacraments to receive the grace of pagan gods. But it is not our task to translate the Gospel into the presuppositions of our society but, as in former times, so to husband our culture as best we can that society will begin to reflect the Gospel. As Orthodox Christians, our primary responsibility is not simply to pull out of whatever ecclesiastical institutions we happen to find ourselves, but to disentangle ourselves and the contemporary church from the presuppositions of the secular society in which we are called to live out the gospel. This can be especially difficult for those who have inherited an establishment mentality. In countries with an established church, such as England or Sweden, the vacillation between a form of Ceasero-Papalism and a virtual congregationalism has made the proper relationship between church, state and society ambiguous at best, though this ambiguity may be somewhat mitigated by a political status which allows the church to see itself as the appointed moral governor and critic of society. In other countries, such as in the United States, where there is no such political establishment, a kind of cultural establishment has taken its place. In America the king need not be Anglican because there is no king, but it is no accident that a third of our presidents have been. This cultural establishment may not have been all that critical so long as the culture seemed to be, at least in its formal rituals and public declarations, an acceptable expression of the Christian faith, but in our post-modern society cultural establishment is an impenetrable barrier to any kind of Christian witness. And in those churches where leaders are elected by the democratic vote of members who are themselves enmeshed in the secular culture, it is catastrophic for biblical orthodoxy. If we are to disentangle the church from its present secular captivity we must critically examine, in the light of Christian orthodoxy, our own presuppositions in every area of our common life: economic, political, sociological and ideological. To do this we cannot simply rely on the literal text of scripture nor adopt whatever hermeneutical interpretation happens to appeal to us. There are issues before us that are not mentioned explicitly in Scripture but which open the flood gates to attitudes contrary to its spirit. Just because Scripture contains no clear directives about such issues as racism or abortion, smoking, euthanasia or women's ordination does not mean that for orthodox Christians these issues are morally neutral or less important than others, like theft, murder or deviant sexual behavior about which Scripture is quite explicit. We need a biblical hermeneutic which can take us beyond the letter of what is written to a greater understanding of what in our culture is or is not consistent with the spirit of Scripture and the mind of Christ revealed therein. Here we must rely on two sources of inspiration. We must re-examine all those books of the bible from the third chapter of Genesis to the Gospel of Matthew in which the ancient Jews developed fundamental sociological, economic and political principles by which the People of God were to be governed. We must become "spiritual Semites". Secondly, without going into the complicated relationship between tradition and Scripture, if we are to have a biblical critique of our own secular culture, we must see how the church, under the guidance of the Holy Spirit, has interpreted and applied scriptural teaching in her understanding of the various cultures in which she has found herself throughout the ages. If we accept that Christ sent the Holy Spirit to guide His church into all truth, then we have to adopt hermeneutical principles which have been generally accepted by the whole church. Several examples spring to mind, such as that no portion of Scripture may be interpreted in a way which contradicts any other portion, or that allegorical, moral and mystical interpretations of Scripture are subordinate to the actual intention of particular authors in writing the various scriptural books. To give one small but important illustration. When St. Paul says that in Christ there is neither male nor female, we must not interpret this in such a way as to deny whatever point he is trying to get across when he says that women should not speak in church. And we must ask ourselves, when we decide to ordain a woman as priest, whether or not we can substitute "mothers" for "fathers" in 1st Corinthians 4 without seriously damaging the meaning and spirit of the text. And if we believe we can make such substitutions, what about those revisionists who change the spirit of other scriptural texts to fit the spirit of the times? However we answer such thorny questions, the principle remains: in order to use Scripture to judge the world, we dare not reinterpret it in the light of the world's presuppositions. In the fields of economics, politics and sociology certain fundamental principles have been adumbrated throughout Christian history as being consistent with the spirit of Scripture even though they are not specifically spelled out in particular texts. In economics, for example, the church has traditionally taught that we may work at a profit but not for a profit and that the taking of interest on nonproductive loans is usurious and immoral. In political practice she has upheld both the principle of solidarity, insisting that the individual person contributes to the common wealth according to his ability and opportunity so that all may enjoy a greater common good, and the principle of subsidiarity, maintaining that the larger group should never do what the smaller group can do just as well. In matters of law she has consistently made a distinction between the relative authority of positive laws passed by church or state and the absolute obedience owing to natural and revealed law. In the field of sociology, the church's theology of the Trinity has provided many insights into the nature of hierarchy, personal relationships and individual rights. We must re-examine these and similar principles if we are to witness to a living orthodoxy. Within the Anglican, Roman Catholic and some Protestant traditions there is a large body of substantial and consistent teaching in all these areas which has largely been forgotten or ignored. We must recover this if we are to provide a realistic critique of our various governing bodies, dioceses and parishes, and a radical alternative to the secularization of the church. The most immediate need at this time however, does not lie in the fields of sociology, politics or economics, as important as these are, but in the field of anthropology. Before we can talk about the rights and wrongs of human behavior we need to clarify our understanding of what it means to be human. We need to recover a Christian doctrine of man. If we are to disentangle ourselves from the secular presuppositions of our society we have to analyze and repudiate some of those common presuppositions about the fundamental meaning of human life which we as Americans hold most dear. We must expunge from our mentality an individualism which presupposes that men and women are, or ought to be, independent, autonomous and competitive individuals who gather together in a variety of groupings only to make money off one another or to defend their rights and interests against other groups of individuals equally trying to defend theirs. Just as the Jews had to learn that God is one before they could understand that He is many, so we must learn that we who are made in His image are communal before we are personal, and that we are Christians because we are faithful members of the People of God, not because of our individual beliefs or opinions. Because truth is corporate rather than private, in our Christian witness we must learn to say, and to sing, "we" before we say "l". In understanding our varied ministries within the Body of Christ we must bear in mind that our participation in the priesthood of Christ comes from membership in His priestly body, the church, not from any inherent power handed out to particular individuals, whether ordained or lay, independent of the church. Too often we forget that in Scripture there is no mention of the "priesthood of all believers" but only the priesthood of the whole church in which all participate by baptism and in which specific people are appointed or ordained to present and facilitate that priesthood by their fatherly and apostolic relationship to the whole body of the faithful. The interior corollary of our American individualism is spiritual subjectivism and its social corollary is a naive egalitarianism. There is too much of talk of "The Holy Spirit told me..." instead of "it seemed good to the Holy Spirit and to us..." Perhaps there are private revelations from time to time, but as St. Paul himself makes clear, their authenticity can only be judged by their consistency with the revelation contained in Scripture as interpreted by the Holy Spirit in the Holy Church. Private inspiration gives no one the right or power to act contrary to either scripture or the corporate tradition of the whole body of the Faithful. In an Anglican commentary on the ordinal composed by Bishop White of Philadelphia in 1833, at the request of the Episcopal House of Bishops, the author argues that when the Prayer Book asks a man if he thinks that he is "truly called, by our Lord Jesus Christ..." he is being asked if he is convinced "that the Church to which he looks for ordination is a true apostolick Church, deriving its authority from that founded by the apostles." And when the bishop asks the ordinand if he trusts that he is inwardly moved by the Holy Ghost to take upon Him this office, the question has to do with his and the church's perception of an inherent ability and moral character suitable for performing this office and ministry. Nowhere does Bishop White refer to a private call or inner feeling. Just as subjectivism has become our primary way of perceiving reality in an individualistic society, so egalitarianism has become our only way of defending individual rights. Unlike true democracy in which everyone participates in the well ordering of society, egalitarianism insists that every individual is fundamentally the same and must be treated the same as every other person. Any idea of social order goes out the window. Organization replaces order, bureaucracy replaces talent, and function replaces being. When egalitarian presuppositions rule the church, canon laws and juridical institutions replace communion and community, ministries replace orders and authorization replaces ordination. Democracy and a hierarchical community of personal relationships is turned into a collectivist and anonymous society. American denominationalism is the ecclesiastical expression of our individualistic and egalitarian society, which all too easily defines or at least affects our self-understanding as a church. 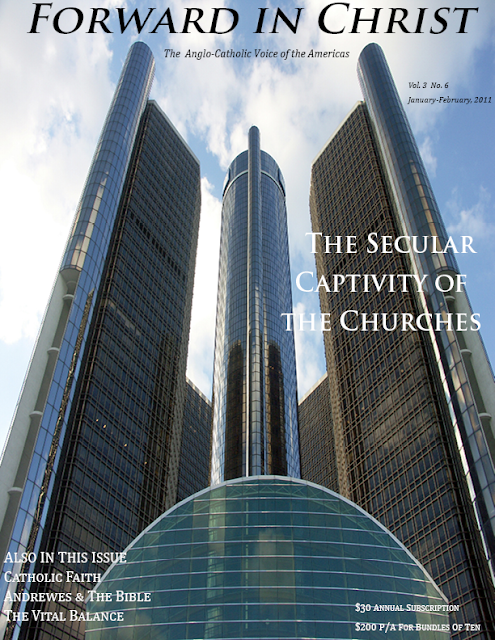 Though specific churches, temples, synagogues or mosques have historically claimed to have some unique and usually superior knowledge of God, in an egalitarian society they are forced to maintain that, fundamentally, any one church or religion is just as good as any other. Individuals choose their particular church either out of habit or according to their individual tastes or private opinions, thus turning churches into collections of self-interest groups organized to help these individuals pursue their own private odysseys towards some unknown god. Attracting enough people to keep the doors open becomes every church's immediate need, and relevance rather than challenge rules the day. This is the trap into which many of our main line churches have fallen. Thinking of themselves as one denomination among many, their leaders adopt a policy of accommodation rather than conversion, all too often offering their members little more than a spiritualized secular cake with a little Christian frosting on top. For those who believe in the catholic and apostolic nature of their church the situation is especially acute, for they have all too often actually exacerbated the process of secularization by claiming a kind of infallibility for all the decisions of their particular denomination. This has certainly been the prevailing view within the Episcopal Church for many years, and has led to what many believe is a non-scriptural, non-traditional and non-Anglican authoritarianism on the part of many of its bishops and governing bodies. In trying to escape from this revisionist authoritarianism, many Episcopalians, especially of a more Evangelical persuasion, are now trying to turn Anglicanism into a "Confessional Church" by identifying a Prayer Book tradition and reaffirming the authority of such classic formularies as the 39 articles. But as laudable as this may seem, it will only internationalize the American denominationalism of the Episcopal Church by treating the worldwide Communion as one infallible denomination among many. It will do little if anything to help any of our churches escape their secular captivity. Let every church cherish their traditions, but let us appeal always to the larger tradition of the whole church throughout space and time, or to what C. S. Lewis called "Mainstream Christianity". Let us look to the church as a Communion rather than a competing collection of ecclesiastical institutions, and then let us decide with whom and to what degree we can be in communion with members of our own particular ecclesiastical institution and of all other ecclesiastical institutions, while still remaining faithful to the Gospel. The Rev. Dr. John H. Heidt (1933-2009) was educated at Yale, Nashotah House Seminary and Oxford. He served as a parish priest in England and America, as well as teaching on the faculty of Marquette University and as Editor of the Christian World newspaper, which he started with Dr. William Oddie. In retirement he served as Canon Theologian for the Diocese of Fort Worth, and was the founding Editor of Forward in Christ magazine. Throughout his ordained life he tirelessly proclaimed, defended and lived the catholic faith as received by Anglicanism.